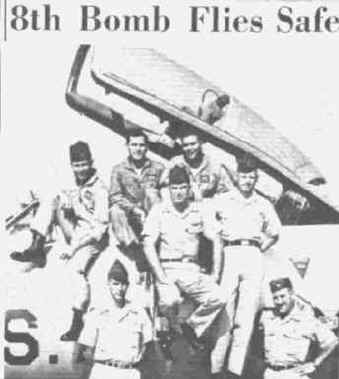 The 8th Bomb Squadron has come up with 11 crew members who have completed 1000 hours accident-free flying time in the B-57 aircraft. Taking a brief moment from arduous tasks are top (l to r) Captains Thomas H. Gallaghan, John M. Hurley Jr., and Clarence D. Hughes. Center (l to r) are Captains Charles Ramsey and James W. Clement. Standing (l to r) 1st Lt. John Stoob, and Major Harry Bickhoff. Absent are Major Wileg Mansfield, and Captains Leslie R. Wilkinson and Charles B. Cox. The EB57's of the "Roving Ravens" are fueled after landing in Greenland. Note the beat-up paint schemes on each aircraft. 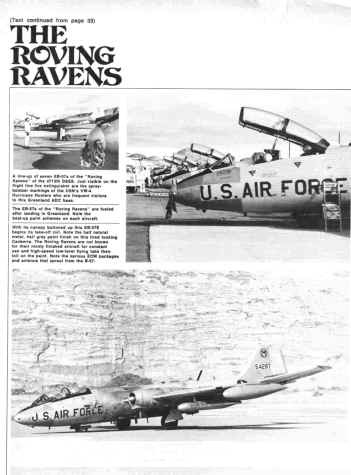 A line-up of Eb-57's of the "Roving Ravens" of the 4713 DSES. With its canopy buttoned up this EB57E begins with its takeoff roll. Note the half natural metal, half gray paint finish on this tired looking Canberra. The Roving Ravens are not known for their nicely finished aircraft. Constant use and high-speed low-level flying take their toll on the paint. Note the various ECM packages and antenna that sprout from the EB-57.